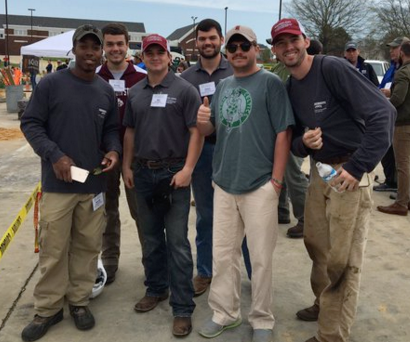 National Collegiate Landscape Competition at Mississippi State University sees over 750 students from 62 schools! If there ever was any indication on what the future professionals look like this is it. 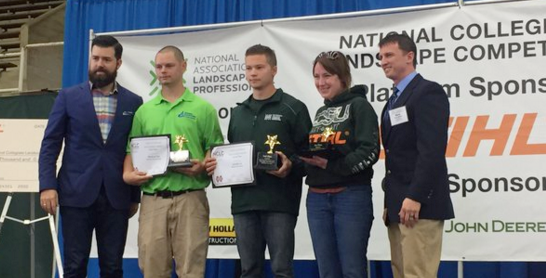 The National Collegiate Landscape Competition took place March 16-19 in Starkville, MS at Mississippi State University. The energy level was through the roof and every student on hand gave up their spring break to compete in this industry event. Their commitment and dedication to getting the absolute most out of their experience in Starkville was ultra apparent. The night before the competition students were camped out in lobbies of all of area hotels cramming in as much information as they could so they would be at the top of their game for the next day. We noticed a few students with their laptops open practicing how to use the various tools inside of DynaSCAPE Design. A Colorado State student was up into the wee hours sketching out their planned design, searching for plant and material photos, and understanding how some of the more advanced tools worked. While we weren’t allowed to help her we did offer some encouragement and caffeine. It was Michigan State University that took the top overall team, but it was Anna Cordiner (pictured above) at Colorado State University that won the best overall performance! The DynaSCAPE team was on hand and very involved by hosting a 3-hour workshop, sponsoring the Computer Aided Landscape Design Competition, and sitting on the organizing committee of the National Collegiate Landscape Competition. In addition to the 28 competitive landscape events, we participated in the largest industry recruiting event all year long. The Career Fair brings some of the biggest landscape companies in the country to recruit the best and brightest young industry professionals. Several students were able to line up interviews at the Career Fair and some were even hired upon their graduation! Some of the big landscape companies were there like BrightView, Land Care, and Mariani Landscape Group interviewing students and handing out swag. If you’re looking to hire young professionals, you’ll definitely want to come next year to Provo, UT at Brigham Young University to catch the next wave. The Computer Aided Landscape Design competition was held March 18 with 31 students. The scope of the project they were tasked with was given to them at an event brief the day before so they had lots of time to prepare. The competitors are given 1 hour and 50 minutes to complete the entire project. Students are provided with a full description of what is expected and given lots of access to training materials and recorded webinars. The winner of this event was a last minute entry who had no previous experience with DynaSCAPE Design. His great coach and instructor at the Cuyohoga Community College in Ohio spent all night with Bryce Axelrod to help get him up to speed. Not only did he place first in the Computer Aided Landscape Design competition, he received the highest score we’ve ever handed out! Congratulations to Bryce Axelrod of Cuyohoga Community College on such a great achievement. Bryce has earned himself his own copy of DynaSCAPE Design, Color, and Sketch3D as well as a one year lab license for the landscape design program at his school. CONGRATULATIONS!! !